Etc.—All of which turned out to be achievable fairly quickly except for one thing; a debugger. 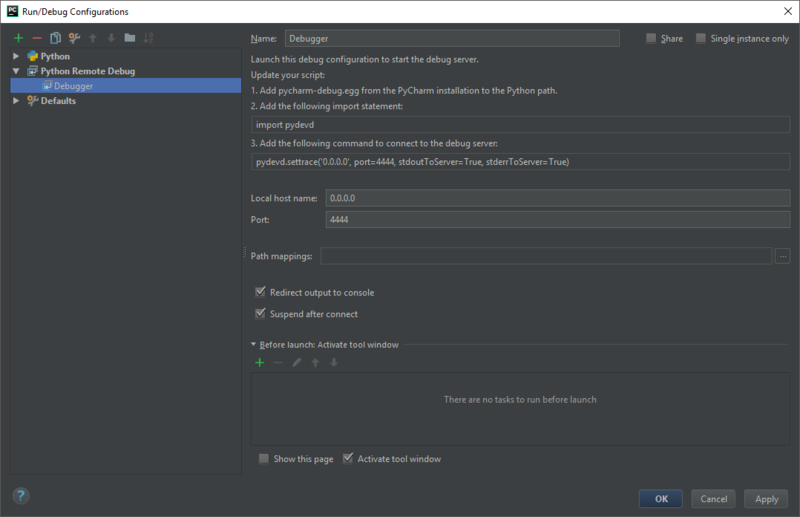 As a result, this article shall be illustrating in fairly reasonably detail how to setup a remote debugger using PyCharm's debug server and their pydevd library. Do bare in mind that you generally do not need to install pydevd seperately using pip. The only reason we are doing so here is because the application itself resides on a different host (the container itself) whereas PyCharm is installed on our development machine. The two will then have to communicate together, which brings us to our next part. Therefore I now know that my host machine's IP is 192.168.33.1. You would then need to only instantiate the Debugger client once at the start of your application and then use it whenever. Additionally there is a flag that only executes the breakpoint if we're in a DEVELOPMENT environment.